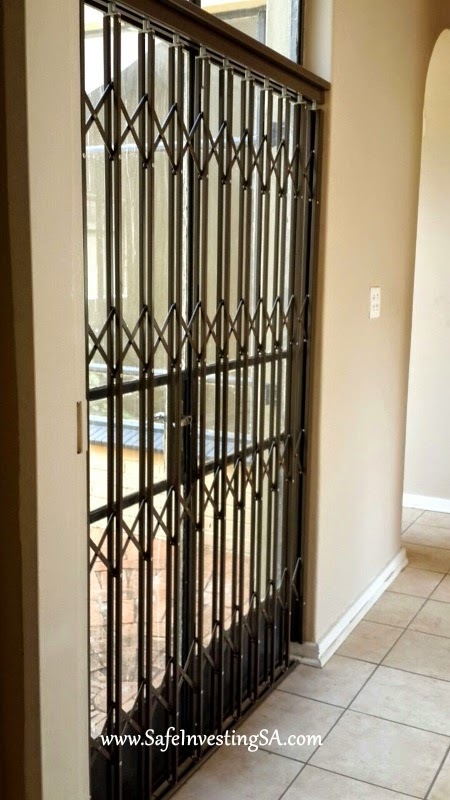 I will never exhaust the topic of preparing a property for rental but I can always share a project of my own. This is my latest property renovation which is now tenanted, thanks God. This is a 4 bedroom, now 3 bathroom family home with servants quarters that house their new full bath. Apologies in advance for the possible slower loading of this post due to the number images. I never took the picture of this kitchen in a good light day. The wall tile is the nice shiny glass mosaic one. A good tile can make or break the kitchen. Rather use the tile minimally and buy a great looking one. 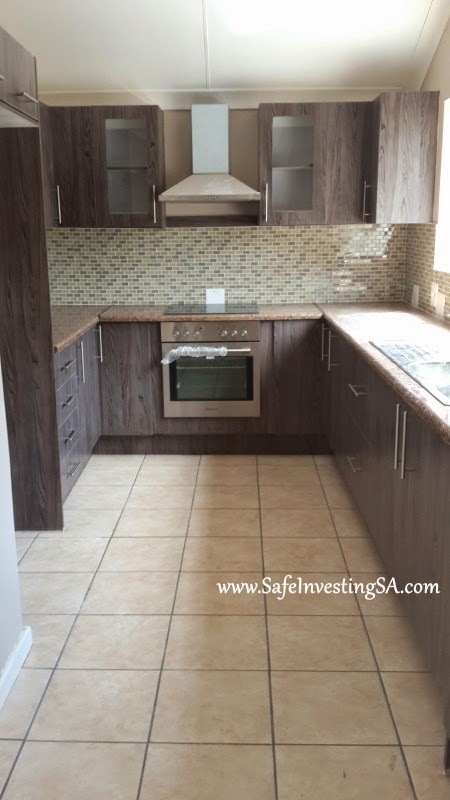 Most people's choice to rent of buy a property is influenced by how the kitchen looks. 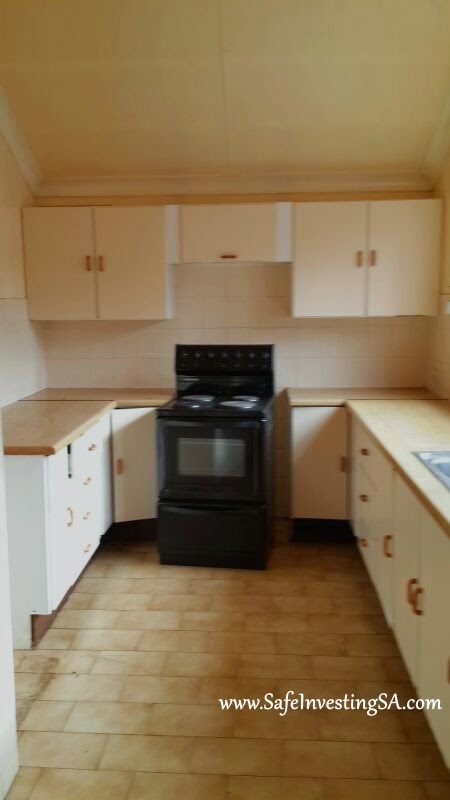 Below is how our kitchen looked when we bought the place. We followed the layout of the original kitchen to save costs on plumbing and electric wiring. Besides, a kitchen this narrow is not easily maneuverable. Nothing was good enough to be reused in the old kitchen. This is a typical galley kitchen; quite narrow but long enough to give a lot of storage space. There is a separate laundry area on the other side too. It is so worth it cleaning up the kitchen and bathrooms. You don't only get a tenant quicker, but increase the probability of getting a higher quality one too. The more the applicants, the better the chance, right! 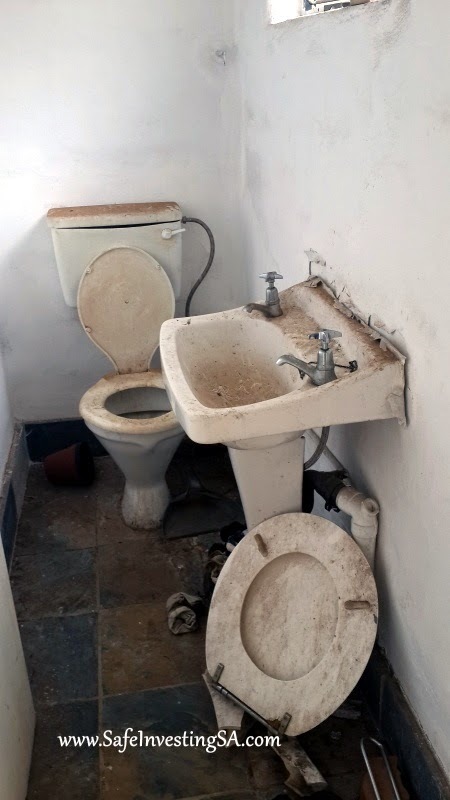 I could not add more photos of this room than necessary, but this was a guest toilet without a hand basin. We added a corner basin as space in this bathroom is an issue. That took it to an ideal 3 full bathroom house. And South Africans do love their bathrooms in numbers. Two bathrooms are viewed as minimum but throwing in a half makes your property more marketable. Modern houses usually have the equal number of or more bathrooms than bedrooms. OBSESSION! This is definitely not a fancy job. I sniffed loads of dust in this process. Remember I am hardly ever on site when this happens but I still feel it. Replacing tiles, basins and toilets with better looking and modern ones increases the marketability of your property. Always remember to go towards neutral colours. Can you spot a white dado rail disguising an uneven wall but also serving as a nice trim? It is far cheaper than re-plastering the wall. You need not break the bank when preparing a property for rental. A can of paint will always up the value of your property. I personally spray painted my old wooden curtain rails to reuse in this project. 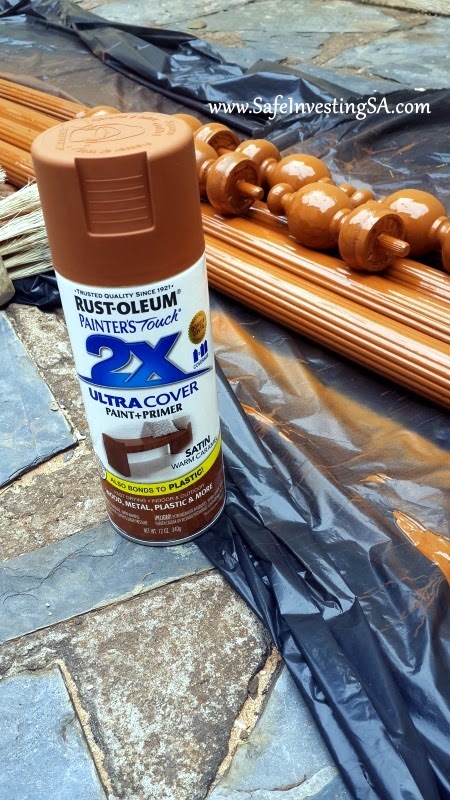 I would have used a nicer looking rust-oleum if the dark stain one was in stock. These had to be left to dry outdoors overnight. Did I mention how much I saved by reusing these old rods? I also used existing metal rails. I still wish I painted those in black. Now to the really scruffy part of the project. 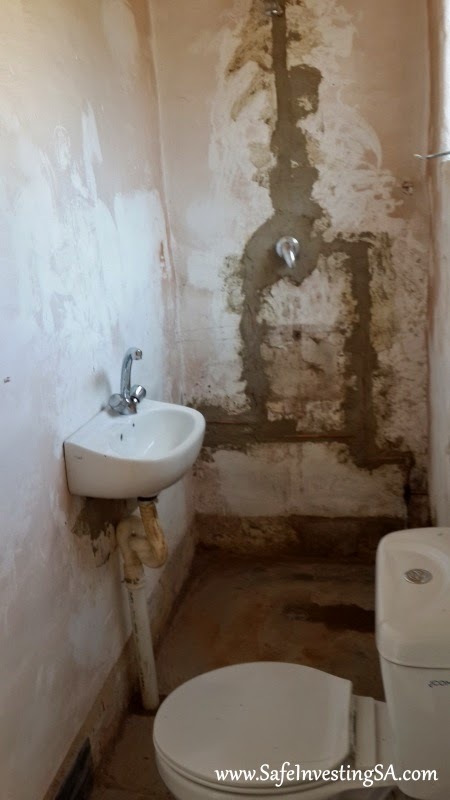 Yes, this is the "before" of an outdoor toilet in the Servant's Quarters. 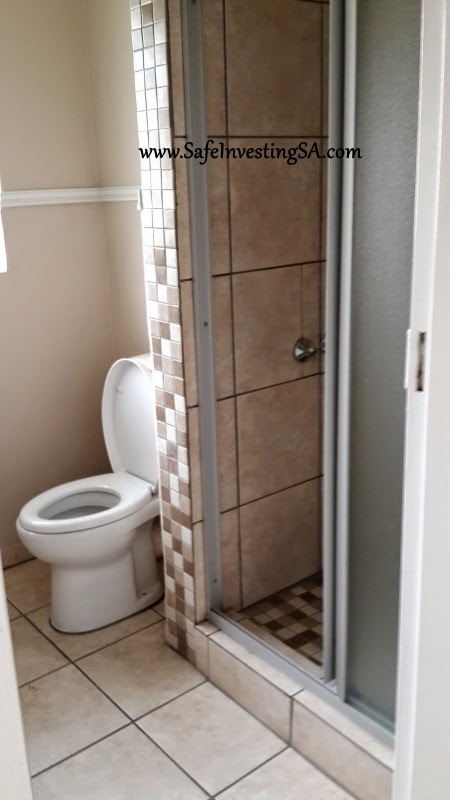 The tenants in this area insist on a fully usable SQ bathroom. And as we all know, what the tenant wants, the tenant gets. 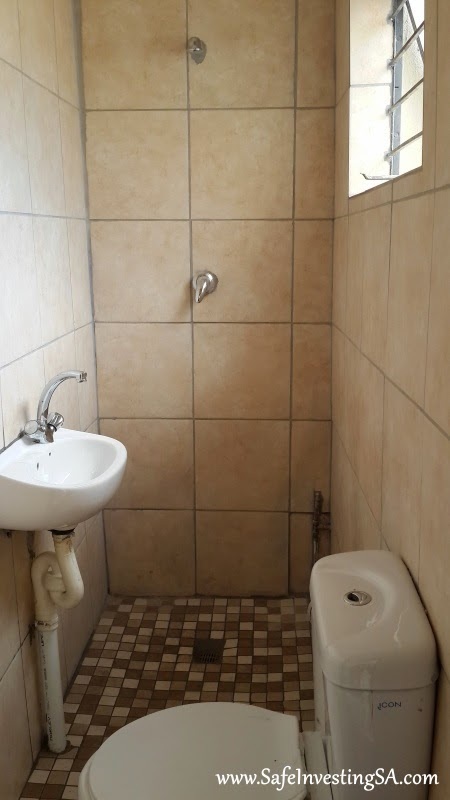 I had a number of hand drawn ways to fit a shower in this tiny one metre wide toilet. At the end, I had to have the basin inside the shower. Exciting to see that everything is fitting nicely. I bought the smallest of everything. That basin is the tiniest. We couldn't even get a mixer that fits in the middle. Did you notice that the mixer is on one side of the basin? Space this small is better off tilled from floor to ceiling and on all walls. This addition was made a little expensive by the fact that water drainage pipes did not exist anywhere close to the space. We had to drill and add pipes inside and outside the room. Sadly, the cost of security is what we cannot escape. This house is made of glass doors. All bedrooms and living areas facing the swimming pool open up to it. I loved these vintage doors but they cried "restore me". Trellis are also not a bad option as they completely slide open during the day. That's how I go about preparing a property for rental. Now to the business side of things. This property is in a street that is fast becoming a business street. Across the street are mainly offices, doctors' rooms, a garage, and the like. It is also in close proximity to restaurants and a shopping complex. What is even more awesome is that it is a walking distance from my home. We have plans to turn it into a commercial property in a year or two. I know I am a location freak but this was an additional strength. There is a reasonable demand for property of this nature in this suburb. Most of the house viewers were corporate clients for their expatriate families. 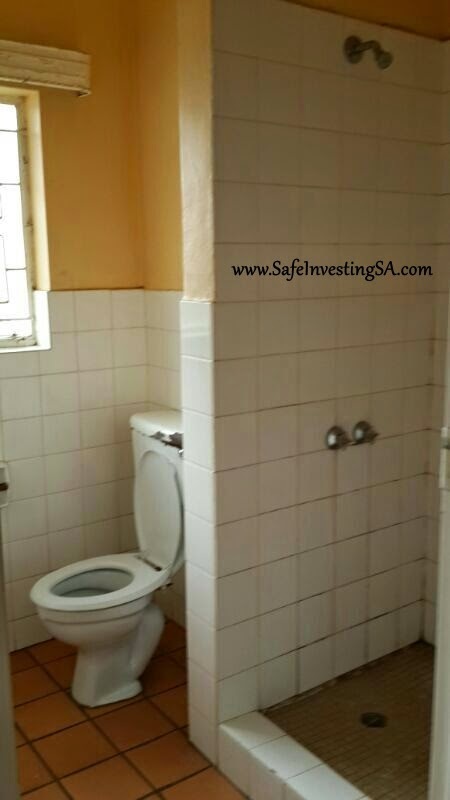 Family homes like this one have to be very close to schools and most recently in Gauteng, Gautrain stations. A number of people commute between Pretoria and Johannesburg daily. This house gets a tick on each of those. I am sort of transitioning to this kind of market specialisation. The plan is to limit the scope to semi or fully furnished corporate homes. This will further limit the quantity of properties I manage (when I start self managing) but hopefully increase the quality and returns. The price was right. When I first saw the listing which only showed the back of the property, I called my agent to investigate who the owner was and get the property for me. This was done in a day. It was quite cool to get interest from buyers after the clean up, but we are not property flippers. I enjoyed this project but it took longer than planned to complete. I am already craving something new to work on. I tend to feel idle in between projects. The life of a serial renovator can be exhausting but definitely exciting. What do you think of my minor renovation? If you find this post helpful, be so kind to share it on your Facebook wall or other social networking platforms using one of the buttons below. Great post. I am interested in property investing as well. 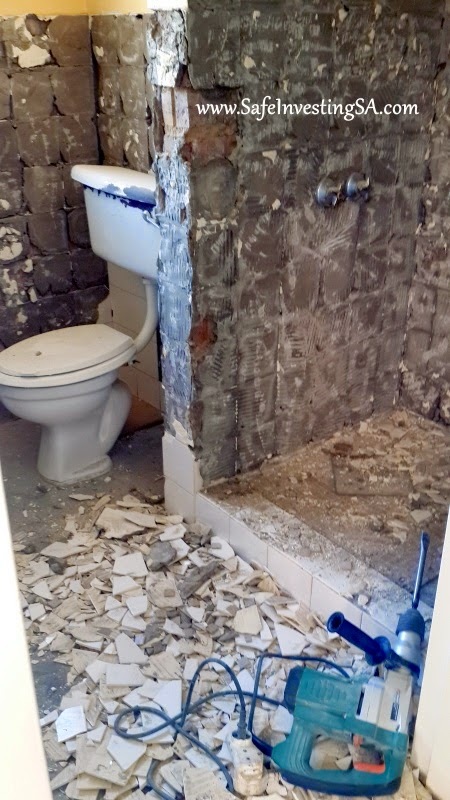 Can you recommend contractors for renovations? Also how much did this renovation cost?